Genotypic analysis of 263 and 356 bp fragments of 18S rDNA obtained from Fasciola hepatica and Fasciola gigantica from Fars province using PCR-RFLP assay demonstrated that nucleotide sequences of F. hepatica from Iran differed to those reported in the other countries. PCR-RFLP bands profile using the DraI restriction enzyme differed markedly between F. hepatica and F. gigantica whereas, PCR-RFLP bands profile of F. hepatica and F. gigantica with restriction enzyme BfrI was similar together. The nucleotide sequencing results of 18S rDNA of F. hepatica and F. gigantica demonstrated 0.3% differences between Iranian F. hepatica and standard F. hepatica reported in genebank. This is the first time that molecular evidence had suggested the possible existence of an intermediate genotype of Fasciola in Iran, in addition to F. hepatica and F. gigantica as its 18S rDNA sequences were unique in that two different 18S rDNA sequences exist in the rDNA array within a single Fasciola worm. This micro heterogeneity is possibly due to sequence polymorphism among copies of the 18S rDNA array within the same worm. Based on our findings a PCR-RFLP should provide a valuable tool for the molecular identification and for studying the ecology, epidemiology and genetic structures of F. hepatica and F. gigantica especially in areas which both species co-exist, as Iran. A. Karimi , 2008. Genetic Diagnosis of Fasciola Species Based on 18S Ribosomal DNA Sequences. Journal of Biological Sciences, 8: 1166-1173. Fascioliasis is an important socio-economics disease caused by Fasciola hepatica and Fasciola gigantica. Besides its well known veterinary importance they are recognized also, as a serious public health problem (Mas-Coma et al., 1999, 2005). Human infection is estimated up to 17 million people (Hopkins, 1992). Importance of this zoonotic food-borne disease with a great impact on human development have been emphasized by WHO and other human health institutes, so, more recently Fascioliasis is added to the list of important helminthiasis (WHO, 1995; Anonymous, 2004). Whereas, in Europe, America and Oceania only F. hepatica is present, in Iran and many other areas of Asia and Africa both species co-exist (Mas-Coma et al., 1999; Rokni et al., 2002; Lotfy et al., 2002; Karimi, 2008). This geographical overlapping gives rise to many problems in the diagnosis, which finally remains classified as Fasciola sp. (Marcilla et al., 2002; Ashrafi et al., 2006). It is usually difficult to accurately discriminate between F. hepatica and F. gigantica because of many variations in the morphological characteristics. Moreover very experimental and field examination based on parasitological diagnosis, clinical, pathological and immunological analysis can not differentiate between F. hepatica and F. gigantica up to the present (El-Shabrawi et al., 1997; Hillyer, 1999; Mas-Coma et al., 2000). The low number of records of human infection with F. gigantica may be due to the lack of good tools to distinguish this species from F. hepatica (Marcilla et al., 2002). The differential diagnosis between F. hepatica and F. gigantica is very important, particular where overlapping observe, because of their different epidemiological diagnosis and characteristics the helmintic parasites (Karimi, 2008). Consequently a rapid and simple test for the differentiation of the two Fasciola species is needed. The usefulness of molecular genetic techniques based on nuclear and mitochondrial DNA was emphasized while addressing problems of identification characterization and phylogeny of parasites (Knox, 2004; Gasser, 2006). Choice of sequences not repeated multiple times in the genome may have the effect of limiting sensitivity. In this study, differential diagnosis was implied at DNA level using the PCR-RFLP technique. The high prevalence of Fascioliasis in the human and livestock populations of Iran and co-existence of F. hepatica and F. gigantica (thus proving the presence of intermediate forms) in all over the country provided basic principles for the present study, the aims of which were to characterize the Iranian Fasciola sp. using 18S rDNA sequence and to establish a molecular tool for the identification of Fasciola sp. from southern part of Iran using genetic markers in the 18S rDNA sequence. Parasites: Adult trematodes of F. hepatica (n = 20) and F. gigantica (n = 20) were collected from the liver of infected sheep and cattle in a slaughter house at Fars (Southern region of Iran) and Gilan (Northern region of Iran) provinces between February 2007 and February 2008. Individual flukes were washed extensively in physiological saline, identified morphologically to genus and/or species according to existing keys and descriptions (Ashrafi et al., 2006) and then frozen (-20°C) or fixed in 70% ethanol until extraction of genomic DNA. DNA isolation and enzymatic amplification: Genomic DNA was isolated from the apical end of adult flukes. After of cutting this part and place into labeled DNA free microcentrifuge tubes. DNA was extracted and purified using DNA extraction kit (MBST, Iran) according to manufacture protocol. The DNA concentration was estimated spectrophotometrically by reading absorbance at 260 nm and the purity of samples was examined OD 260 nm/OD 280 nm. Additionally the DNA was analyzed by electrophoresis on a 1.5% agarose gel in TBE buffer (0.095 M Tris-Borate, 0.001 M EDTA). The gels were stained with ethidium bromide and the DNA was visualized using an UV transilluminator (Karimi et al., 2008). DNA samples were stored at -20°C until further use. The 18S rDNA molecule is highly conserved in both F. hepatica and F. gigantica, with no intraspecific variation and only a few interspecific nucleotide differences (Karimi, 2008). Basing on this, a fragment of 263 and 356 bp of the 18S rRNA gene, including 2 nucleotide differences between F. hepatica and F. gigantica were selected and PCR methods to amplify them were developed by Marcilla et al. (2002). The first amplification was done on the 263 bp fragment of 18S rRNA gene using the forward primer DraI-sense: (5`- CATATGCTTGTCTCAGAGATTAAGCC - 3`) and reverse primer DraI-Antisense (5`- CGATCAGTGAAGTTATCCAGAGTC-3`) and a second amplification was done on the 356 bp fragment of this genomic part using the forward primer BfrI-sense (5`- CGAAGACGATCAGATACCGTC-3`) and reverse primer BfrI-antisense (5`-AGCAGGCCAGAGTCTCGTTC-3`), (Karimi, 2008). PCR reactions (total volume of 100 μL) containing 20 ng of genomic DNA, 10 μL PCR buffer 10X (Cinnagen Company, Iran), 0.2 mM dNTPs each, 1.5 mM MgCl2, 2.5 U Taq DNA polymerase (Cinnagen Company, Iran) and 0.2 μM of each primers (Cinnagen Company, Iran): in a thermocycler (MWV-Germany) under the following conditions: 95°C for 5 min (initial denaturation), followed by 35 cycles of 94°C, 1 min (denaturation), 60°C, 45 sec (annealing), 72°C, 1 min (extension) and a final extension of 72°C for 10min. Samples without genomic DNA were included in each amplification run as negative controls. An aliquot (10 μL) of each amplicon was examined on 1.5% agarose-TBE (65 mM Tris-HCl, 22.5 mM boric acid and 1.25 mM EDTA, pH 8.0) gels stained with ethidium bromide and photographed upon transillumination. The 100 bp DNA ladder marker (GeneRuler 100 bp DNA ladder plus, Fermentas Company) was used to estimate the sizes of the 18S rDNA amplicons. Purification, sequencing and analysis of the Fasciola 18S rDNA PCR product: Representative PCR products were purified using spin columns (PCR purification kit, MBST, Iran) and the purified PCR products were sent to Kawsar Biotech Company (Tehran-Iran) for sequencing using Genetic Analyzer 3130, automated DNA sequencer (Applied biosystems USA). The 5` and 3` ends of the Fasciola 18S rDNA sequences were determined by comparison with previously published Fasciola 18S rDNA sequences (Turbeville et al., 1992; Fernandez et al., 1998) and the sequences were aligned manually. Pairwise comparisons were made of the level of sequence differences (D) using the formula D = 1-M/L (Chilton et al., 1995), where, M is the No. 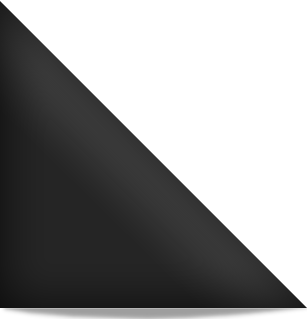 of alignment positions at which the two sequences have a base in common and L the total No. of alignment positions over which the two sequences are compared. Restriction maps of the Fasciola 18S rDNA sequences were determined for a range of common enzymes using the MacVector program (Version 4.1, Kodak). PCR-linked restriction fragment length polymorphism (PCR-RFLP): Purified F. hepatica and F. gigantica 18S rDNA PCR products (21.5μL) were digested directly with 20units (1μL) of restriction enzyme DraI and BfrI, respectively in 25μL for 1h at 37°C (Fermentas). Then a volume of 25 μL of restricted samples were mixed with 5 μL of loading buffer and transferred onto a 1.5% agarose gel together with a 100bp DNA ladder marker (Fermentas) for fragment size determination. DNA fragments were thereafter separated by horizontal electrophoresis in 0.5X TBE buffer at 100V for 1.5h. The gel was stained using ethidium bromide staining and then photographed upon transillumination. 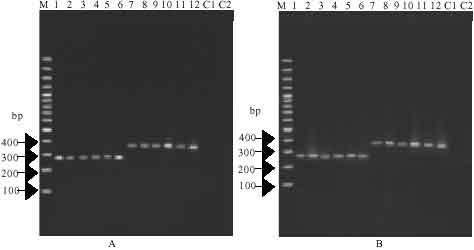 PCR amplification, sequencing and analysis of Fasciola 18S rDNA: The trematode specimens from Fars, Southern region of Iran were identified as F. hepatica and F. gigantica according to morphological criteria. Genomic DNA was isolated from 20 individuals of F. hepatica and 20 specimens of F. gigantica from sheep and cattle for comparative purposes. As expected, a fragment of approximately 263bp and 356 bp length was amplified from each parasite gDNA and in no case was product amplified from No-DNA sample (Fig. 1). A sequence of 263 and 354 bp were obtained for each of the 4 specimens representing F. hepatica and F. gigantica from sheep and cattle amplified with primers DraI and BfrI, while a 263bp sequence was obtained from F. hepatica and F. gigantica specimens of sheep and cattle amplified with primers DraI whereas 356bp fragment produced with primers BfrI in all specimens. Automated sequencing of the amplicons composed of partial 18S rDNA sequences of 263 and 354 bp. While, there was no variation in length or composition of the 18S rDNA sequences among multiple specimens from sheep and cattle but sequences difference including 2 nucleotides were detected between specimens from F. hepatica and F. gigantica (Fig. 2, 3). While, no variation in length or composition of the two 18S rDNA sequences was detected among the two sequenced specimens of sheep and cattle, the consensus in the 356 bp fragment of 18S rDNA sequences of F. hepatica was different from those of specimens from gene bank of accession numbers AJ004969 and X56041 in that one variable sequence positions were polymorphic, with the differences of bases from the 18S rDNA sequences representing specimens from gene bank and that from Iran (Fig. 3). But 18S rDNA sequences of F. gigantica specimens of Fars were similar to standard F. gigantica reported in genebank (Accession No. AJ011942 and AJ004804). Characterization of F. hepatica and F. gigantica by PCR-RFLP: Based on the restriction maps generated for the 18S rDNA sequences of the F. hepatica and F. gigantica (not shown), the restriction endonucleases DraI and BfrI were selected for the delineation of the F. hepatica and F. gigantica by PCR-RFLP. The undigested 18S rDNA PCR product of primers DraI 263bp in length and with primers BfrI was 356 bp (Fig. 1). When the 18S rDNA PCR products were digested with DraI restriction enzyme, two bands of approximately 50and 213 bp were produced for F. hepatica samples from sheep and cattle (small sizes of the 50 bp band was not clearly visualize) but F. gigantica remained undigested (Fig. 4). PCR-RFLP profiles with restriction enzyme BfrI, consisted of two similar DNA bands of approximately 102 and 254bp in length from both F. hepatica and F. gigantica samples of sheep and cattle (Fig. 5). To assess variation in restriction patterns among individuals of Fasciola, the 18S rDNA was amplified from 40 individuals from sheep and cattle and the amplicons were then subjected to RFLP analysis with these two restriction endonucleases, as expected, no variation in restriction pattern was detected among multiple individuals from the same fluke, consistent with sequence data. The sizes of the digestion fragments were in accordance with calculations based on the restriction maps, except the co-migrating fragments. Fascioliasis has shown to be a greatest food borne parasitic disease in Iran. Southern regions of Iran (as a Fars and Khuzestan provinces) appear to be the important endemic areas including most human and animal cases. In these southern endemic areas of human fascioliasis in Iran, environmental characteristics favour liver fluke transmission as well as lymnaeid presence (Mas-Coma et al., 2005) and both F. hepatica and F. gigantica are present simultaneously in individual cattle and buffaloes (Sahba et al., 1972). High prevalence of fascioliasis in livestock and human from Iran has been worth mentioning. Moreover, at the end of the 1980s and during the 1990s several large epidemics, including thousands of human cases, were reported that appear to the largest epidemics of human fascioliasis throughout the world (Moghaddam et al., 2004). Overlapping distribution of both F. hepatica and F. gigantica has even become the basis of an already long controversy on the taxonomic identity of these species occurring in some countries, especially Iran, Egypt, Japan, Taiwan, the Philippines and Korea, in which a wide range of morphological types is detected. At the extremes of this morphological range, some resemble F. hepatica, whereas others resemble F. gigantica with intermediate forms also occurring and involving phenomena such as abnormal gametogenesis, diploidy, triploidy and mixoploidy, parthenogenesis and hybridization events between different genotypes (Mas-Coma et al., 2005). Existence of intermediate forms of Fasciola from countries as Iran caused difficulty and confusion in the identification of specimens using parasitological, immunological and pathological analysis (Ashrafi et al., 2006; Periago et al., 2008). In the present study, samples of the Fasciola were characterized using well-defined 18S rDNA sequence because previous studies have shown that rDNA sequence provides reliable genetic markers for the accurate differentiation and identification of Fasciola species (Zurita et al., 1988; Barker et al., 1993; Hashimoto et al., 1997; Itagaki and Tsutsumi, 1998; Blair, 2005; Nolan and Cribb, 2005). Using restriction maps of the ribosomal genes, demonstrated that a Fasciola isolated from Japan was identified to F. gigantica but different from F. hepatica. No intraspecific variations in the restriction endonuclease maps of F. hepatica or F. gigantica were detected, but length heterogeneity was noted in the intergenic spacer even within individual worms (Blair and McManus, 1989). Difference were detected in the 28S rDNA gene of F. hepatica in sheep and F. gigantica in cattle, but were not intraspecific variation performed. Another study demonstrate that individual cows infected by numerous genetically different liver flukes (Karimi et al., 2008). Differences among nucleotide sequences of ITS2 (internal transcribed spacer 2) fragment of the rDNA gene obtained from F. hepatica and F. gigantica were shown, besides proved that ITS2 sequence is identical for F. hepatica, which differ in various geographic origins (Mas-Coma et al., 2005). Analysis of the ITS2 and d2 regions were found to be polymorphic; that is, out of five Fasciola, two possessed a F. gigantica-type sequence, one, a F. hepatica-type sequence and two possessed sequences of both types indicating an existence of different alleles at the loci. It should be noted that these variations of the ITS2 and d2 regions co-occur at the same individual worms (Agatsuma et al., 2000). The rDNA sequence of Fasciola sp. from Japan matched closely that of F. gigantica and demonstrates variability in nucleotide sequence within the ITS2 region which allows discrimination between species of fasciolidae. Sequence divergence between F. hepatica and F. gigantica was 2.8% but intraspecific sequence divergence was negligible (Adlard et al., 1993). Using PCR-RFLP assay, with restriction enzymes AvaII and DraII, was described to distinguish between both fasciolid species. It was based on a 618-bp-long sequence of the 28S rRNA gene besides this sequence showed a few nucleotide differences between both fasciolids and no intraspecific variations within each species (Marcilla et al., 2002). In the present study the 263 and 354bp fragments of 18S rDNA gene of the F. gigantica were no variation in length or composition among multiple specimens from other part of world. When the restriction endonuclease DraI was used, the 18S rDNA PCR products of F. gigantica from sheep and cattle remained undigested as they lacked restriction site for DraI whereas, F. hepatica from sheep and cattle produced two bands of approximately 50 and 213bp in sizes (Fig. 4). The 354bp fragment of 18S rDNA PCR products of both F. hepatica and F. gigantica from sheep and cattle after digested with restriction enzyme BfrI produced two similar bands of approximately 102 and 254bp length (Fig. 5). Similar restriction maps of F. hepatica and F. gigantica with BfrI restriction enzyme supported by PCR product sequencing as similar nucleotide sequences of 356 bp fragments of 18S rRNA gene between these flukes detected. The 18S rDNA sequences obtained from the present study were compared with Turbeville et al. (1992) and Fernandez et al. (1998) and it was found that the part of 18S rDNA sequence with 263 bp length of F. hepatica and F. gigantica from sheep and cattle from Fars continent was identical to that of F. hepatica and F. gigantica from elsewhere (Fig. 2), whereas according to Fig. 3, the 356 bp fragment of 18S rDNA nucleotide sequence differences of 0.3% (1/356) was detected between F. hepatica from Fars province to F. hepatica published previously on the other part of the world (Turbeville et al., 1992; Fernandez et al., 1998). This study showed that the 18S rDNA sequences of F. hepatica from sheep and cattle from southern regions of Iran were quite unique in that two different 18S rDNA sequences exist in the rDNA array of a worm. One of the sequences was identical to that of F. hepatica and the other was almost identical to that of F. gigantica in that nucleotides at one polymorphic position represent F. gigantica. This micro heterogeneity is possibly due to sequence polymorphism among copies of the 18S rDNA array within the same worm. The consensus 18S rDNA sequence of Fasciola appears to be a mixture of that of F. hepatica and F. gigantica with the presence of the bases of both F. hepatica and F. gigantica 18S rDNA sequences at one variable sequence positions. This finding was also consistent to some extent with result of morphological identification as specimens were atypical of either F. hepatica or F. gigantica morphologically. These results indicated that Fasciola from Fars may represent an intermediate genotype or even a hybrid between F. hepatica and F. gigantica, although there are other possible explanations to the existence of sequence polymorphism in the 18S rDNA array of Fasciola from Fars, such as introgression or lineage sorting and retention of ancestral polymorphism (Dr. Robin Gasser, personal communications), these findings are supported by the results of the previous study (Agatsoma et al., 2000; Karimi, 2008). This is the first time that molecular evidence had suggested the possible existence of an intermediate genotype of Fasciola in Iran, in addition to F. hepatica and F. gigantica. The nucleotide variation in the 18S rDNA sequences of the Fasciola sp. resulted in differences in restriction sites for endonuclease BfrI. Hence, a PCR-RFLP assay was used to characterize and differentiate the Fasciola sp. The PCR-RFLP method described here can be used for the proper identification of Fasciola species and become a helpful tool for the specific diagnosis of the liver fluke causal agent of fascioliasis in human and animal subjects in geographical areas such as Iran, where, both F. hepatica and F. gigantica appear to be sympatric and clinical, pathological, coprological and immunological analyses do not allow a differentiation between them. It might also be a useful alternative to distinguish between the two Fasciola species at veterinary level in those overlapping distribution areas in which they often coexist in the liver of the same domestic animal and morphological characteristics of the fluke adult stage are tedious, time consuming and sometimes not sufficient for the necessary specific classification. Moreover the 18S rDNA characterization of the Fasciola sp. and the establishment of a PCR-RFLP assay for their delineation have important implications for studying the population genetic structures and ecology of these Fasciola species and may also have implications for the diagnosis and control of Fascioliasis of humans and ruminants. Further studies are warranted to clarify the nature of intermediate genotype in Iran using other genetic makers. This study benefited from the collaboration between Islamic Azad University of Kazeroun, Iran and University of Tehran, Iran. I would like to extend deep gratitude to Dr. Parviz Shayan, my favorite professor at veterinary collage of Tehran University who taught me way more about molecular biology than I would ever know. Adlard, R.D., S.C. Barker, D. Blair and T.H. Cribb, 1993. Comparison of the second internal transcribed spacer (Ribosomal DNA) from populations and species of fasciolidae (Digenea). Int. J. Parasitol., 23: 423-425. Agatsuma, T., Y. Arakawam, M. Iwagami, Y. Honzako and U. Cahyaningsih et al., 2000. Molecular evidence of natural hybridization between Fasciola hepatica and Fasciola gigantica. Parasitol. Int., 49: 231-238. Anonymous, 2004. Editorial: Thinking beyond deworming. Lancet, 364: 1993-1994. Ashrafi, K., M.A. Valero, M. Panova, M.V. Periago, J. Massoud and S. Mas-Coma, 2006. Phenotypic analysis of adults of Fasciola hepatica, Fasciola gigantica and intermediate forms from the endemic region of Gilan, Iran. Parasitol. Int., 55: 249-260. Barker, S.C., D. Blair, A.R. Garret and T.H. Cribb, 1993. Utility of the d1 domain of nuclear 28S rRNA for phylogenetic inference in the digenea. Syst. Parasitol., 26: 181-188. Blair, D. and D.P. McManus, 1989. Restriction enzyme mapping of ribosomal DNA can distinguish between fasciolid (Liver fluke) species. Mol. Biochem. Parasitol., 36: 201-208. Blair, D., 2005. Ribosomal DNA Variation in Parasitic Flatworms. In: Parasitic Flatworms: Molecular Biology, Biochemistry, Immunology and Control, Maule, A.G. and N.J. Marks (Eds.). CABI Press, Wallingford Oxfordshire, pp: 96-123. Chilton, N.B., R.B. Gasser and I. Beveridge, 1995. Differences in a ribosomal DNA sequence of morphologically indistinguishable species within the Hypodontus macropi complex (Nematoda: Strongyloidea). Int. J. Parasitol., 25: 647-651. El-Shabrawi, M., H. El-Karaksy, S. Okasha and A. El-Hennawy, 1997. Human fascioliasis: Clinical features and diagnostic difficulties in Egyptian children. J. Trop Pediatr., 43: 162-166. Fernandez, M., D.T. Littlewood, A. Latorre, J.A. Raga and D. Rollinson, 1998. Phylogenetic relationships of the family campulidae (Trematoda) based on 18S rRNA sequences. Parasitology, 117: 383-391. Gasser, R.B., 2006. Molecular tools-advanses, opportunities and prospects. Vet. Parasitol., 136: 69-89. Hashimoto, K., T. Watanobe, C.X. Liu, I. Init and D. Blair et al., 1997. Mitochondrial DNA and nuclear DNA indicate that the Japanese Fasciola species is F. gigantica. Parasitol. Res., 83: 220-225. Hillyer, G.V., 1999. Immunodiagnosis of Human and Animal Fasciolosis. In: Fasciolosis, Dalton, J.P. (Ed.). CAB International Publishing, Wallingford, Oxon, UK., ISBN: 9780851992600, pp: 435-447. Hopkins, D.R., 1992. Homing in on helminthes. Am. J. Trop. Med. Hyg., 46: 626-634. Itagaki, T. and K. Tsutsumi, 1998. Triploid form of Fasciola in Japan: Genetic relationships between Fasciola hepatica and Fasciola gigantica determined by ITS-2 sequence of nuclear rDNA. Int. J. Parasitol., 28: 777-781. Karimi, A., B. Meshgi and P. Shayan, 2008. Intraspecific genetic variation of Fasciola hepatica using RAPD-PCR. The 6th National and the 1st Regional Congress on Parasitology and Parasitic Diseases. Razi Vaccine and Serum Research Institute, Karaj, Iran. Knox, D.P., 2004. Technological advanses and genomics in metazoan parasites. Int. J. Parasitol., 34: 139-152. Lotfy, W.M., H.N. El-Morshedy, M.A. El-Hoda, M.M. El-Tawila, E.A. Omar and H.F. Farag, 2002. Identification of the Egyptian species of Fasciola. Vet. Parasitol., 103: 323-332. Marcilla, A., M.D. Bargues and S. Mas-Coma, 2002. A PCR-RFLP assay for distinction between Fasciola hepatica and Fasciola gigantica. Mol. Cell. Probes, 16: 327-333. Mas-Coma, S., M.D. Bargues and M.A. Valero, 2005. Fascioliasis and other plant-borne trematode zoonoses. Int. J. Parasitol., 35: 1255-1278. Mas-Coma, S., M.D. Bargues, A.M. Marty and R.C. Neafie, 2000. Hepatic Trematodiases. In: Pathology of Infectious Diseases, Meyers, W.M., R.C. Neafie, A.M. Marty and D.J. Wear (Eds.). Armed Forces Institute of Pathology and American Registry of Pathology, Helminthiases, Washington, DC., pp: 69-92. Mas-Coma, S., M.D. Esteban and M.D. Barques, 1999. Human Fasciolosis. In: Fasciolosis. Dalton, J.P. (Ed.). CAB International Publishing, Wallingford, Oxon, pp: 411-434. Moghaddam, A.S., J. Massoud, M. Mahmoodi, A.H. Mahvi and M.V. Periago et al., 2004. Human and animal fascioliasis in Mazandaran province, Northern Iran. Parasitol. Res., 94: 61-69. Nolan, M.J. and T.H. Cribb, 2005. The use and implications of ribosomal dna sequencing for the discrimination of Digenean species. Adv. Parasitol., 60: 101-163. Periago, M.V., M.A. Valero, M. El-Sayed, K. Ashrafi and A. El-Wakeel et al., 2008. First phenotypic description of Fasciola hepatica/Fasciola gigantica intermediate forms from the human endemic area of the Nile Delta, Egypt. Infect. Genet. Evol., 8: 51-58. Rokni, M.B., J. Massoud, S.M. O'Neill, M. Parkinson and J.P. Dalton, 2002. Diagnosis of human fasciolosis in the Gilan province of Northern Iran: Application of cathepsin L-ELISA. Diagn. Microbiol. Infect. Dis., 44: 175-179. Sahba, G.H., F. Arfaa, I. Farahmandian and H. Jalali, 1972. Animal fascioliasis in khuzestan, southwestern Iran. J. Parasitol., 58: 712-716. Turbeville, J.M., K.G. Field and R.A. Raff, 1992. Phylogenetic position of phylum nemertini, inferred from 18S rRNA sequences: Molecular data as a test of morphological character homology. Mol. Biol. Evol., 9: 235-249. World Health Organization, 1995. Control of foodborne trematode infections. WHO Tech. Rep. Ser., 849: 1-157. Zurita, M., D. Bieber, G. Ringold and T.E. Manssur, 1988. CDNA cloning and gene characterization of the mitochondrial large subunit (LSU) rRNA from the liver fluke Fasciola hepatica evidence of heterogeneity in the fluke mitochondrial genome. Nucleic Acids Res., 16: 7001-7012.